Andrew is a Mechanical Engineering student at Staffordshire University, and grew up in Manchester. A keen pool and snooker player, Andrew admits he enjoys eating essentially any food item inside a wrap. 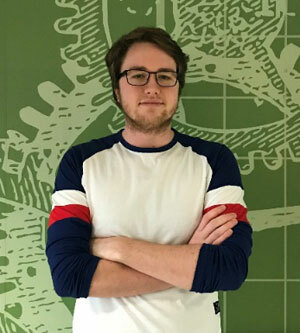 He credits the leader of the Engineering department lead at Staffordshire University, Chris Wayman, with helping him extensively over the years to develop in engineering design and how Andrew communicates concepts to others. Andrew’s design reimagines the wheelchair with caterpillar tracks that will allow the user to navigate tricky terrains, such as bumpy roads or kerbs, with every aspect of the chair adjustable for the comfort of the user. The chair would also feature numerous gadgets on the arm of the chair for ease for the user. My invention is to make a more accessible wheelchair for everyday use, that can be used in non-accessible places for example like going up curbs, rough terrain. Also, the Adept-a-Chair has a help alarm to help the user if they fall out the chair or are in trouble. Another feature is the chair can rise upwards, so the user can reach higher places to help with everyday tasks like cooking and shopping. This product is designed to help disabled people of any age who are physically impaired and use a wheelchair or similar. I chose to design an idea for people who have a physical disability because I didn’t think there was enough products out there, that enhanced physically disabled people’s lives. By being able to do what they want and not be obstructed by non-disabled accessible places or buildings. This concept has been done before but I think it can be developed to be cheaper and greater. Which would mean it would be more open to the public and help those who need it the most. The caterpillar tracks are for to be able to go upstairs and rough terrain. The tracks would work by having the front and back at an angle so can support itself with having the load over a wide area. Also, be driven by a single axial with wheel on either side, this would let the wheel chair go forwards, backwards and turn. This would need to be battery powered, which would be easy for the user to recharge by a charging bay or magnetic connecters. The main function for the pistons is to be able to lift the user up to help with reach objects higher up and to doing activates that wouldn’t be able to do in a normal wheelchair. Furthermore, the pistons are to stabilise the user when going up and down stairs. On the Left arm chair there will be a help system implemented at the end of the arm for if the user is in trouble, they can put their finger down on the finger scanner for five seconds to set the alarm off or can be voice activated. The control panel is used to be able to control where the user wants to go and to be able to activate the pistons on and off. Every bit of the seat, arms and foot rest would be adjustable for the user to be comfortable to use. The main back of the chair would be able to go flat and the arm rest come fully down, this is for the user to be able to go straight out of bed into the adapt-a-chair; the reason I put this into the design was because one of the main issues physically disabled people face, is the energy it takes to get out of bed. 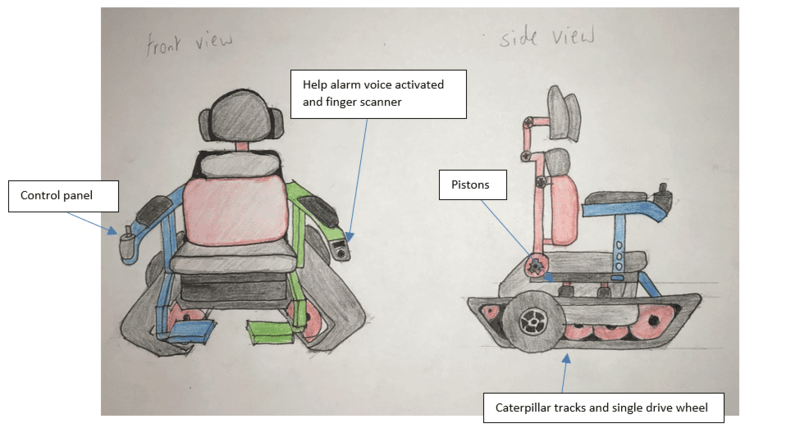 I think my design is different because the Adapt-a-Chair does a lot more to better disabled people’s lives, by tackling the problem head on like the caterpillar tracks or helping towards the problem like the pistons. I think to make a prototype of my design would cost £3000-£4000 this is because of just the materials themselves would cost £1500-2000 and then the engineering would cost £1500-2000. But I think it would be worth the time and effort to build, develop and construct the Adapt-a-Chair. Click here to go return to the Engineering for Access shortlist.